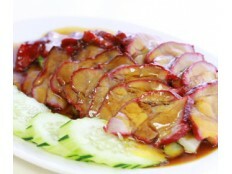 What is there about Kung Fu Thai and Chinese Restaurant that makes it a magnet for an impressive number of sports celebrities, stars and other VIPs ? You don’t have to go far to get your answer. 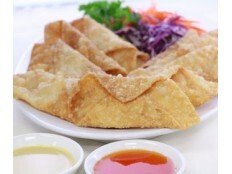 Just follow your Las Vegas Thai Food taste buds and the unmistakable smell of fine Oriental cuisine throughout the restaurant. In a word it’s the food that has attracted and continues to attract these discriminating diners, public figures from the worlds of entertainment, business and government. 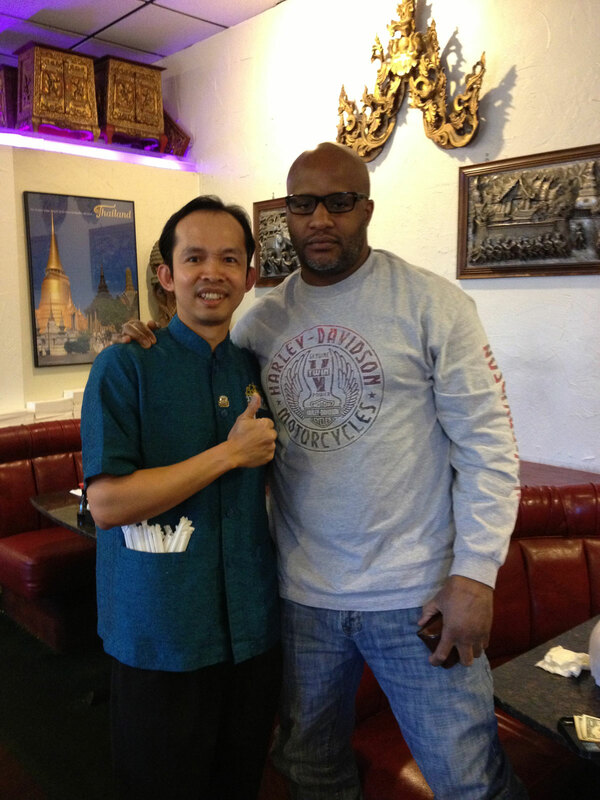 Recently, during the Chinese New Year festivities at the Kung Fu Thai and Chinese Restaurant, the place was astir because of the unmistakable presence of the athletic Michael Moorer, three-time world heavyweight boxing champion. This retired, Brooklyn-born southpaw fighter scored knockouts in each of his first 26 bouts, putting him in the pantheon of the world’s best boxers ever to go in the ring. But he didn’t come to fight. He came to eat his favorite Thai Food Las Vegas dish: Pad Thai. He loved it so much that he ordered another helping to go. Is there something special about our Pad Thai in Las Vegas that makes knowledgeable world-travelers such as Michael Moorer come back for more? 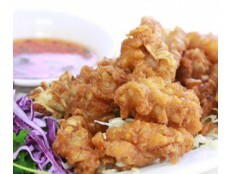 It’s probably in the authentic Pad Thai sauce that has that tangy and spicy flavor that only the chefs at Kung Fu know how to create. 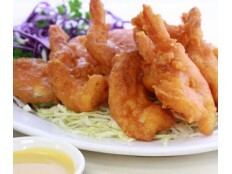 Other than this “secret sauce,” Pad Thai’s well-known ingredients are expertly combined in a masterful creation. The basic Pad Thai dish consists of rice noodles, then one adds either chicken or shrimp, followed by garlic, red chilies, bean sprouts, green onions, coriander or cilantro, chopped peanuts, vegetable oil and is served with wedges of lime. Makes one hungry already. It’s interesting to note, Pad Thai was a fairly recent creation, though it has become one of Thailand’s most popular dishes. Back in the 30’s and 40’s Thailand’s prime minister started a campaign to promote Thai nationalism and centralization. Luang Phibunsongjhram wanted to reduce domestic rice consumption because Thailand’s economy was heavily dependent on exporting rice. The problem was that the people ate too much rice, reducing the amount for export. His shrewd plan was to encourage Thais to make and sell rice noodles (thus less rice) from street carts and restaurants. Apparently his plan worked for it also became a national Thai dish. 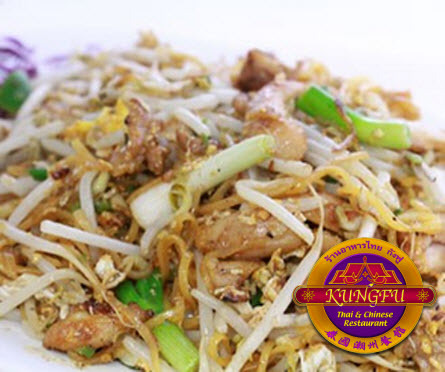 For Pad Thai or any other authentic Thai Food in Las Vegas or Chinese dish, there is no better place to dine than Kung Fu Thai and Chinese Restaurant of Las Vegas. You can catch glimpses of stars and celebrities on “The Strip,” but at the Kung Fu Restaurant you can actually watch them eat. Like you, they will be smiling.